My boys love to bring treats for their classmates at Christmas, but their school discourages parents from sending in sugary treats. 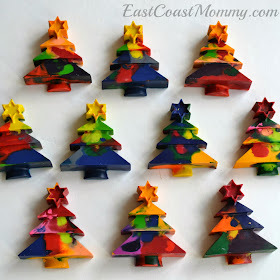 So... this year I came up with these adorable recycled crayons for my 5 year old to share with his friends. To make the crayons, I used a silicon mold (that I found at the dollar store), and I followed the tutorial that you can find here. 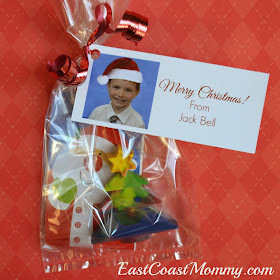 Then, I put crayons and little notepads in clear cellophane bags, and I tied them up with cute personalized tags. I think my son's friends are going to love these recycled crayons, don't you? Wonderful! Do you recycle old crayons? Or do you buy them new? I bet you have tons of fantastic shapes.